Ian reports an extremely cold but fine morning (minus 3 degrees C) at Grosmont on Wednesday (sounds great, and cheaper than having the air conditioning on here! ), with Bill Dobson, Steve Hyman, Derek Shorten, Ian McCall, Nigel Hall, Nigel Bill and Ian himself. First job was cleaning out the stove ready for lighting and putting the kettle on. The main jobs were getting all the components ready for the cold boiler exam tomorrow (Friday), so, after the usual cuppa, Derek started cleaning hand hole and mud hole doors, Nigel Bill removing the gauge frame components, rodding out the holes into the boiler, and also removing the old Klinger packings - this was done on both the Q6 and J27. Steve removed, dismantled, and cleaned the steam heat valve from the Q6. Bill checked the dimensions of the safety valve seats. As has been previously reported, there was quite an accumulation of water in the pit and the pump kept failing, so Ian M spent nearly all morning trying to get it working: it would go for a while then stop. After removing lots of cinders and other foreign bodies it began to work again. Then it gave up the ghost, resulting in Ian M taking the pump to bits once more and finding lots of small plastic ties accumulated in the workings. Eventually, with these removed, it worked perfectly all day. During this time there was a strong smell of bacon cooking. 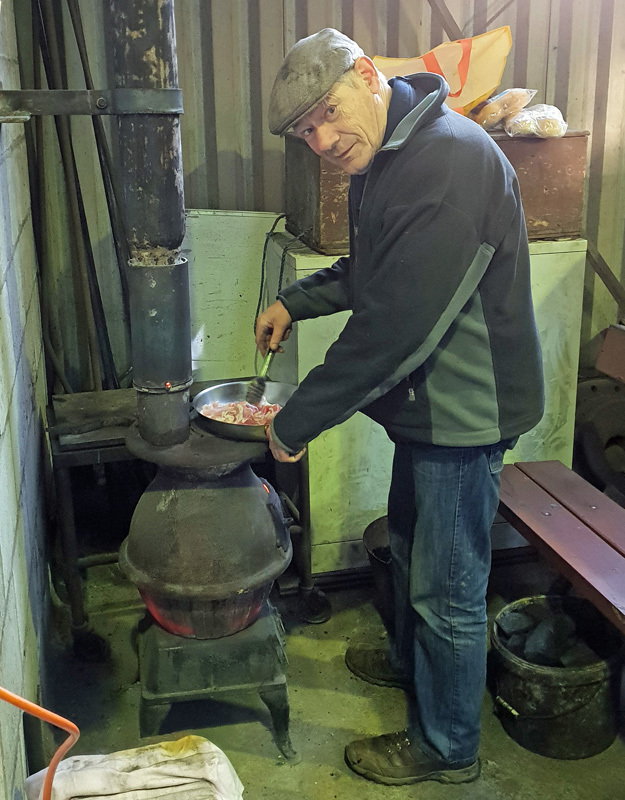 Bill had brought his frying pan and a pound of bacon and some buns, and set to with producing some bacon butties (see photo). So it was round the stove and butties 'aal roond' (and I am missing out yet again :'(). After we got the water removed from the pit, the two Ian's set about blowing compressed air through the reverser to get rid of any water that had accumulated in the steam side, and eliminate the chance of frost damage to the reverser. An air line was set up and connected to the reverser using the new compressor in Deviation Shed . Ours is currently out of action and awaiting a new inspection door. Once quite a bit of water had been blown out using the reverser forwards and back a couple of times, the airline was disconnected and the steam pipe re-fitted to the reverser. As a result of having bacon butties mid morning, a later lunch was had around the stove. Both piston back covers have been machined and brought back to our workshop to be fitted next week. Ian M completed cleaning the faces for these covers on the cylinders using some heat and a scraper, and finishing off with emery paper. Nigel Hall completed cleaning and priming the right hand side of the Q6 tender frames: both sides of the frames are now in primer. The J27/P3 has been washed out and is in Deviation Shed on No 7 road.